Two single-engine war planes collided while landing at an experimental air show Friday, killing one pilot and injuring the other. 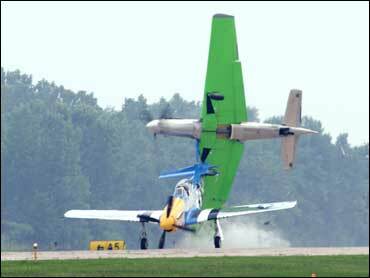 The Federal Aviation Administration said the accident with the two P-51 Mustangs happened at 3:17 p.m. after the planes finished a performance at the Experimental Aircraft Association's annual AirVenture show. P-51 Mustangs are single-seat fighters that were used in World War II. FAA and the National Transportation Safety Board investigators were on the scene on Friday. NTSB spokesman Ted Lopatkiewicz said one pilot died and the other had minor injuries when the planes clipped wings on landing. He said an NTSB investigator on the scene scheduled a news briefing at 1 p.m. Saturday at the Wittman Regional Airport terminal. On Monday, a veteran pilot trying to break a speed record en route to Oshkosh was killed when his small, experimental plane crashed into an apartment building and playground in Switzerland. The pilot, identified as Hans Georg Schmid, a former Swissair pilot, had been trying to break a world record for a solo single-engine flight. He had planned to fly more than 4,970 miles with a C1-D class of plane, aiming to reach his destination in 30 hours. The annual AirVenture convention is considered one of the world's largest gatherings of recreational aviators. It draws more than 600,000 people and 10,000 planes from around the world. The weeklong event ends Sunday.